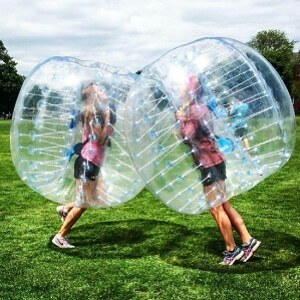 ​Bubble Soccer birthday party and indoor sports arena. With the ever-increasing rise of “Facebook and Instagram parenting” placing over the top party ideas on social media, I think all parents feel the pressure to deliver the perfect birthday party experience for their kids. What social media can present is a culture that hints your standard pizza party is no longer good enough. When I think of some of my fondest birthday memories, they were parties where my friends and I experienced something together. These experiences were as easy as my parents taking us all out to a restaurant or simply playing flashlight tag in the backyard. In today’s society, it can feel like these experiences don’t quite measure up. Parents are wracking their brains to find alternative experiences for their kids and their friends; experiences that set their kid’s party apart to make it unique and memorable… and of course, FUN. Fortunately, “experiential retail” is the growing industry of indoor facilities catered to hosting fun new experiences to customers who walk right through their front door. Here is a list of indoor birthday party ideas and places near you to make your kid’s next party one they will never forget. ​This one may seem obvious but it’s a solid option. Kids have TONS of energy and there is no question that allowing them to jump their hearts out for an hour or so can make for a great time. Many trampoline parks offer foam pits, dodgeball, basketball hoops, and wall to wall jumping options. If you have high energy kids or are simply looking for an excuse to separate your child from a phone screen or video game, this is a great idea. Go-karts just breed excitement. I can remember the first time I got behind the wheel of a go-kart at age ten. Clearly, I was too young to drive an actual vehicle on the road but on the go-kart track, I now had the power of acceleration and racing all on my own. It felt like a whole new world! If your kids are a competitive bunch, have them race it out on a go-kart track! Many go-kart facilities will offer party packages including multiple races for your kids within a given timeframe. Depending on the size of the facility, they may even have multiple tracks to choose from. Let’s face it; every adrenaline junkie’s dream from an early age is to go skydiving at some point in his or her life. Now imagine you could take all of the risk out of it and give your child and his/her friends that opportunity in a controlled environment. Who says you have to jump out of an airplane at 13,000 feet to experience the thrill of free fall? Rather, try stepping into a vertical wind tunnel floating in place. ​Additionally, your friends will be cheering you on from outside the glass. It becomes a fun viewing experience or all so the excitement is enjoyed together. These facilities offer group packages including proper training, gear, and photo/video packages. 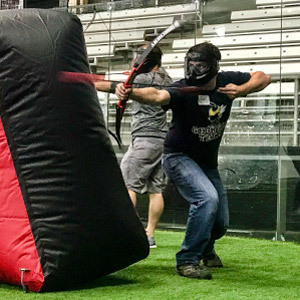 Do you ever see a viral video of people in those inflatable balls running into each other or what looks like people playing archery dodgeball? 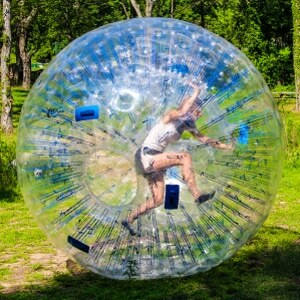 How about the giant zorbs you can run and roll around in? At a time when kids are glued to screens, it is nice to be able to offer them an active alternative. This is almost a more personalized version of the trampoline park. Let your kids ​choose what games they want to play and simply rent that equipment. Services often offer these games with trained staff to coordinate the fun with your kids while maintaining safety throughout the party. These game packages are typically fully customizable to work within your budget and timeframe, which is nice when dealing with fluctuating RSVPs. ​When I hear lasertag, it inherently has a fun futuristic feel to it. We can’t deny video games like Fortnight captivate the youth of today but allowing them to live out those worlds in an active setting with their friends can make for a great time. Laser tag is an age old game since I was a kid, but competing facilities have only made these places more creative and inventive. Take the risk and physicality of paintball out and your kid still has a competitive series of showdowns with their friends in fun venues. These facilities often offer group rates so your kid and his/her friends can play for a decent price and often have the entire facility to themselves. As an avid Lord of the Rings fan, my first time experiencing Medieval Times was incredible. You witness what feels like front row action of trained stuntmen jousting, sword fighting, and more. The venue allows your kids and their friends to transport to another time and receive a full dinner and show. Everything from the food itself, the waiters, and the show of course make it feel like you are a fan watching a showdown of knights competing for the hand of a princess. The organized seating arrangements of the “stadium” also give each section a knight to root for which can allow your group to really get into it. Maybe your kid is a little older and loves riddles/puzzles. Your child and their friends should consider an Escape Room. These places often offer themed experiences in a room full of clues that they must solve within a given timeframe. It requires teamwork and thinking outside of the box and a sense of competitiveness to “escape” in the quickest time possible. Escape Room facilities can offer rooms with varying difficulty and multi-room options. This can be a really fun group experience that is different than your standard “hang out”. ​Video games are WAY different than the Atari/PlayStation 1 days of my childhood. Games are far more interactive, customizable and an increasingly more so shared experience now. Kids today can now play with their friends online from the convenience of their own home. Companies like GameTruck, however, deliver that shared experience through a trailer filled with linked gaming consoles. They make it so your child can play their favorite online multiplayer games along with twenty of their friends sitting in the same ​space. When you have options like these, it makes sense why the traditional arcade doesn’t cut it anymore. ​Taking gaming to a whole new level, virtual reality is the ultimate immersive experience for any gamer. VR Gaming facilities will offer different game modes and experiences depending on the participant’s preferences. It’s amazing how a simple helmet and hand controls can transport you into a new world. This world could be exploring jungles filled with dinosaurs, surviving a zombie apocalypse or fighting in a boxing match. Facilities will have viewing areas for family friends to not only see the player's perspective but also how the player is reacting physically. ​It can make for a lot of laughter and a lot of fun memories. Since I was little, going to the movies was always a treat. My dad would take my friends and I to new Friday releases of the most anticipated films coming out during our childhood. It felt special and my friends would spend the car ride home acting as amateur movie critics debriefing all of our thoughts on what we just experienced. With the rise of luxury theaters, the “going to the movie experience” has never been nicer with leather recliners and seatside dining. Now consider having one of those theaters reserved solely for your kids and his/her friends watching the movie of their choice. Depending on your budget, this can be a really fun and unique experience to make your kid’s birthday feel special. How many times have you told your kid to stop climbing on something? Or to come down from that tree? Kids naturally have an instinct to explore and use their energy. Indoor rock climbing gyms can be a great option to allow kids to act out these most primal of instincts in a safe controlled environment. It becomes a fun group experience when friends can cheer one another on to push past their fears and challenge themselves to physically reach the top of their climbing walls. The nice thing about these facilities is that they have walls of varying difficulty so everyone’s skillset can be accommodated. ​With many of these party options, their facilities offer party rooms for having food or a space for the birthday boy/girl to blow out their candles and enjoy cake with their friends. Please note for any of these fun indoor options, its fairly common that there is a waiver requirement for all participants so you will want to coordinate those with parents of the kids attending. Sometimes this can be as simple as sending out a link with your e-vite. Each of these options varies in price and involves different levels of activity. You know your budget and your kid’s interests best so think about what they would enjoy most and what makes the most sense for you. Now go create some fun memorable experiences your kid will never forget.